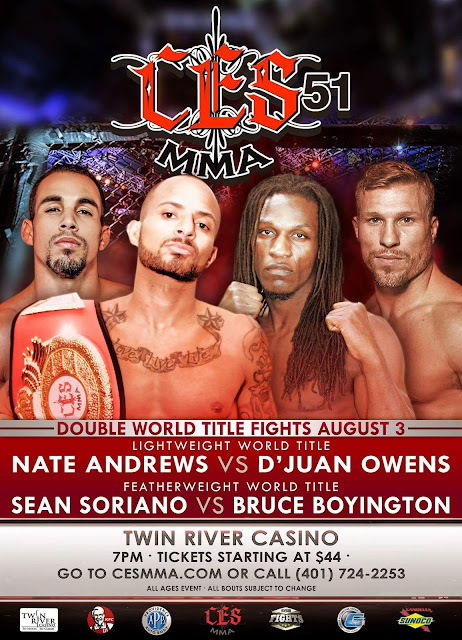 Jimmy Burchfield’s Combat Entertainment and Sports is back at Twin River Casino in Lincoln, Rhode Island Friday August 3rd and the bounty continues to be plentiful; as two CES World Title Belts will be put on the line when the bells ring in CES 51. UFC Hall of Famer Pat Miletich and Ron Kruck will play host as CES 51’s main card will be televised live on AXS TV starting at 9pm eastern time, and will air six feature bouts from the evenings stacked fight card. CES’s current Lightweight Champion and fan favorite Nate “The Snake” Andrews (13-1) will be looking to take another step closer to the UFC by defending his Lightweight strap against North Carolina’s D’Juan “Dirty South” Owens (16-12-1). Andrews has been knocking on the door to the UFC for almost two years now with no reply, but Andrews continues to do everything in his power to keep his dream alive; finishing each of his opponents over his current seven fight winning streak dating back to 2015. Owens has lost three of his last five bouts but is always a game opponent; he showed CES fans just how game he actually is at CES 27 when he battled Luis Felix to a decision loss. Andrews doesn’t plan on needing the judges in his attempts to dispatch Owens as he looks to continue on his impressive streak, right on through to the UFC Lightweight Roster. Speaking of the UFC, Rhode Island native and former UFC Featherweight; Sean Soriano (11-5) has mounted back to back wins in the CES cage putting him smack dab in the middle of the CES Featherweight Title picture as he is set to battle former World Series of Fighting Featherweight and Former NEF Lightweight Champion; Bruce “Pretty Boy” Boyington (15-11) for the vacant CES Featherweight World Title. Bantamweight stud Kris Moutinho (5-2) makes the quick turn around; after an even quicker Knockout of Al Jones at CES 50. Moutinho once again makes the jump up in competition drawing his toughest foe to date, in North Carolina’s Da’Mon Blackshear (5-1). Also on the main card; New Hampshire’s resident grappling guru; Featherweight, Dylan Lockard (3-1) will look to bounce back off the first loss of his career as he battles tough veteran Branden Seyler Sr. (8-6-1). Veteran Lightweight on the New England MMA scene; Louis Corapi (8-3) is excited to be back in the CES cage where he meets New York’s Jacob Bohn (6-5) who will be seeking back to back wins under the CES banner. Natural born Wrestlers lock horns in the first televised fight of the evening, when Bellator Featherweight veteran Blair Tugman (10-7) tests his skills against the quickly emerging Shane Manley (4-3) as the lights begin to burn bright at CES 51. Five preliminary fights kickoff the action from the Twin River Events Center; where some familiar names look to solidify their spots on the CES roster. Providence’s Eric Bedard (6-7) meets Maine’s Ras Hylton (2-1) at Heavyweight, Flyweight Hilarie Rose (1-1) welcomes Ivana Coleman (1-3) to the CES cage. Emerging Light-Heavyweight prospect; Fabio Cherant (2-0) draws Maine’s Buck Pineau (1-5), Atomweight Marisa Messer-Belenchia (1-0) looks to make a splash in her CES debut against Los Angeles’ Kaiyana Rain (1-3) and Bantamweight Jesse Pires (0-1) returns against former Flyweight Jeff Silva (1-3). CES MMA 51 kicks off live from Twin River at 7 pm Eastern Friday night, August 3rd, with a star studded Main Card; televised live nationally on AXS TV; starting at 9 pm Eastern. For Ticket information visit CESMMA.com. Click Below for complete matchup breakdown of all 11 fights. Summary: Bosting just a 2-7 record as an Amateur, Pires tried his hand at the professional ranks in his last contest; ending up on the wrong side of the action once again. Jesse will be looking to show that even though he took the loss against Michael Taylor at CES 46, his experience on the big stage has him poised to make his next appearance a successful one. Last fight: First round TKO loss to Michael Taylor at CES 46. Summary: After nearly eight years away from competition between 2009 and 2017, Lawrence’s Silva bounced back in 2017 by submitting Kenny Rodriguez in the second round of their bout at Combat Zone 62 to notch his first professional victory. Silva followed up with a hard fought decision loss to Kenny Murphy at Combat Zone 63, but is eager to be back in the cage and making his CES debut on New England’s biggest stage. Last fight: Unanimous decision loss to Kenny Murphy at Combat Zone 63. Breakdown: There is no doubt that these fighters will be looking to make names for themselves as they kick off the evening at CES 51. Both fighters have taken their share of losses early in their careers, and with the eyes of New England focused on them, each fighter will be looking to hand out a loss as these Bantamweights clash in the first fight of the night. The question will remain; will Silva’s ten years in the sport, trump the experience that Pires has gained in the CES cage? Last fight: First round Submission victory over Grace Nowak at Premier FC 26. Summary: Each of Rain’s four professional bouts have gone to the judges scorecards, including two fights with Women who went on to fight for the UFC; Kailin Curran and most notably Tecia Torres. However, Rain has wound up on the wrong side of those decisions three times in her career, tasting victory just once in four starts at the professional level. Kaiyana’s full set of skills will be put to the test as the competition continues to be fierce in Connecticut’s Belenchia. Last fight: Split Decision loss to Alyssa Garcia at Combate 11. Breakdown: This is an intriguing match-up between girls with high level skills and endless gas tanks, both of these girls are capable of high volume offensive outputs for a full fifteen minutes. I imagine these girls are simply going to try to tear each other apart and test the will of one another. Aggressiveness could be key in this matchup as both of these girls are prepared to go hard for a full three rounds. Summary: Cherant continues to garner high praise amongst the Light-Heavyweights of New England, with a slick submission game and the physique of an action figure, there is no doubt that Fabio looks the part of a big time fighter. Cherant’s stock is definitely on the raise following two first round submission victories to kick off his professional career. Cherant is still looking for the opportunity to show the region the power he possesses in his hands, but he is happy to keep the victories coming anyway they present themselves. Last fight: First round Submission of Marquis Allen at CES 50. 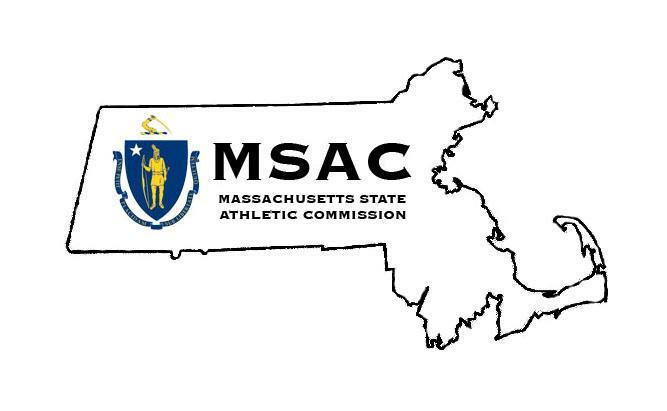 Summary: Maine’s Pineau has not had an easy go of it as a professional, continually drawing some of the baddest Middleweights and Light-Heavyweights in the entire region. The crafty striker Pineau has drawn Pat McCrohan, Tim Caron and Mike Rodriguez in his last three bouts as part of a four fight winless streak. But Buck continues to test himself as he steps in with Cherant, in hopes that he can be the first to connect and hand the upstart Cherant the first loss of his young career. Last fight: First round TKO loss to Pat McCrohan at CES 46. Breakdown: Fabio Cherant is a beast, and we may have only seen the tip of the iceberg with this kid, who has finished his last five fights by submission spanning back to his Amateur career. Fabio would like to show the CES crowd how far his striking has come as he has expressed interest in standing and banging with someone. But Buck Pineau isn’t the kind of guy you wanna stand and bang with, a brawler who is constantly looking to shut out the lights; Pineau would welcome the opportunity to swap a little leather with the quickly rising Cherant. Summary: Norwell’s Rose followed up a hard fought loss to Linsey Williams at CES 48 to open her professional career, with an impressive dismantling of Thais Souza last time out as CES 50. Rose will once again be looking to cash in on the skills that made her an Amateur champion and one of the most highly touted Strawweights in New England. Rose will be stepping into the CES cage for the third time in 2018 at CES 51, in effort to stack up back to back wins for the region's top promotion. Last fight: First round Submission of Thais Souza at CES 50. Summary: Victim of back to back submission losses in her professional career, Los Angeles’ Coleman ended an almost seven year layoff from MMA in February when she took the cage against Miranda Granger at Combat Games 60. Coleman made her professional debut in June of 2010 against current UFC title challenger Cat Zingano, losing by first round knockout, on her way to a 1-3 record overall as a Pro. Last fight: First round Submission loss to Miranda Granger at Combat Games 60. Breakdown: A clash of two different styles, this fight comes down to who is able to employ their game plan most effectively. Louisiana's Coleman is most effective when she uses her Muay Thai striking to keep her opponent at distance where she can pick her apart with finesse and calculated strikes. Finesse is out the window for Rose however, Hilarie is a scrappy, in your face type fighter who thrives in the clinch and in tight quarters and will be looking to put the pressure on Coleman early and often. Last fight: First round Submission loss to Tyler King at CES 35. Summary: The intrigue behind Maine’s is similar to that of the creature from which he draws his name. Rasquatch’s towering size and his technical striking have landed him in prospect status here in New England. Focusing on some holes in his grappling game following his first career loss as a Martial Artist his last time out to Joshua Marsh in his CES debut; Hylton looks to bounce back strong with a dominant performance against the grizzled veteran Eric Bedard and further the intrigue behind the 6 foot 8 inch Striker from Maine. Last fight: First round TKO loss to Joshua Marsh at CES NY 1. Breakdown: Make no mistake about it these guys both love to throw some leather and I’m sure both intend on doing so early on in this fight. Bedard possesses some seriously heavy hands and has the ability to put anyone out with just one shot. Hylton’s striking is more of the technical variety, Ras likes standing at distance and picking apart his opponent, this will be a tough plan to employ as I see Bedard trying to push the pace and close the distance in this fight. Although both of these men love to strike, I believe it would be wise for Bedard to use his strikes to eliminate the distance and take Ras to the ground, where Bedard’s submission skills should trump those of Hylton’s. If Ras can keep this fight standing he should find his path to victory will be much clearer than if this fight ends up on the mat. Summary: Veteran of eight fights for Bellator MMA, amassing a record of five wins with three losses for the promotion; North Haven’s Blair Tugman makes his first appearance in the CES cage since a Decision loss to current UFC Bantamweight Andre Soukhamthath at CES 17 in 2013. The Andrew Calandrelli ‘protege’ has used grappling expertise and toughness to become one of the most highly respected Featherweights in the region and a win over Manley could vault Tugman into Featherweight title picture here at CES. Last fight: Unanimous Decision loss to AJ McKee at Bellator 182. Summary: New York’s Manley got the attention of CES fans his last time out as he dismantled top prospect Dylan Lockard over three rounds earning a decisive decision victory and leaving his name one the tongues of the Featherweight Division. Manley is an overwhelming grappler who allows his opponents very little room in which to work their game. Manley’s wrestling will be tested to the fullest degree as he meets one of the most notorious wrestlers in the New England Featherweight Division; Blair Tugman. Last fight: Unanimous Decision victory over Dylan Lockard at CES 48. Breakdown: This fight is an absolute grapplers dream, both men possess top level wrestling techniques and motors that won’t quit. Manley showed what his is capable of in his last fight against fellow grappling prospect; Dylan Lockard, when he neutralized Lockard’s offense by constantly putting him in compromising positions on his way to a decision victory. But Blair Tugman is no prospect, Tugman is one of the veterans in the region, with 17 professional fights for some of the biggest organizations on the scene, Connecticut’s Tugman has “been there and done that”on his way to ten professional victories with four coming by submission. You can rest assured that there will be bodies flying around the cage in this one as both men try to drag one another into deep water looking for the kill! Summary: Since being the last man to conquer top Featherweight prospect; Vovka Clay, New England veteran Louis Corapi has been on the shelf for the past 20 plus months. A mainstay across the Northeast; Corapi will be taking to the CES cage for the fourth time as he looks to get his promotional record back to the .500 mark against Jacob Bohn. Last time Corapi took the CES cage he shared it with former CES Lightweight World Champion Julian Lane, falling victim to a third round submission, Corapi looks to leave the CES cage with a little twist of fate this time out! Last fight: Unanimous Decision victory over Vovka Clay at Combat Zone 60. Summary: Bohn has gone to war fight in and fight out, over his 11 fight professional career, and his last time out was no different for the New York native, who earned a hard fought split-decision victory over Kenny Foster at CES NY1. It’s one up and one down for Bohn at CES as he draws another tough opponent in Boston’s Corapi, as Bohn looks to once again stake his claim on the Lightweight division inside the CES cage. Last fight: Split Decision Victory over Kenny Foster at CES NY 1. Breakdown: This should be a very exciting fight between two well rounded veterans of the cage; both fighters have been in some absolute wars over the years and this one looks like more of the same. Although both of these fighters are comfortable wherever this fight ends up look for Corapi to be more eager to keep this fight on the feet, as his Sityodtong pedigree would suggest, and expect Bohn to try to get this fight into the clinch where he is better suited to work his crafty submission techniques. Summary: The Upstart New Hampshire native; Lockard, suffered the first loss of his young career in his last fight when he was out pointed in the grappling department for three rounds against Shane Manley at CES 48. Lockard was forced to try and turn to his striking near the end of the fight against Manley in efforts to neutralize the strong grappling of the New Yorker. Although Lockard wasn’t able to secure the win, his striking looked like it had vastly improved as he tested Manley’s chin several times at striking distance. Lockard looks to put it all together as the competition gets more intense when he matches wits with Branden Seyler Sr.
Last fight: Unanimous Decision loss to Shane Manley at CES 48. Summary: Seyler has been called on for the fourth time by CES matchmaker Pat Sullivan and each time Seyler has drawn an opponent with an incredible amount of hype behind them. Seyler has gone 1-2 for CES owning losses to both Kody Nordby and Dinis Paiva as well as a huge win the last time he took the CES cage against Kris Moutinho. Seyler’s submission game makes him a tough out for any Feather or Bantamweight he lines up against, as six of his career eight victories have come via submission. Seyler will be looking to make it back to back wins for the first time since 2016 at the expense of Lockard. Last fight: Third round Submission victory over Antonio Castillo Jr. at Bayfront Brawl 5. Breakdown: This is without a doubt the biggest step up in competition Dylan Lockard has faced in his young career, coming off a decision loss to Shane Manley at CES 48 the prospect Lockard will have to be on his “A game” if he hopes to notch his second win in the CES cage against Branden Seyler Sr. Seyler has made a name for himself in the promotion as a game opponent, having matched up with top talents in the past, Seyler has his ambitions set on a shot at the Featherweight belt if he can get past the grappling game of Lockard and find himself in the winner’s circle. That will be easier said than done with the likes of Lockard standing across the cage, but no task seems too big for Seyler as his submission game is a threat to finish any fight at any time. Summary: Moutinho followed up back to back losses by knocking out Al Jones in the very first round ar CES 50, starting what Moutinho hopes is his next long string of victories. Moutinho is a gifted striker who bites down on his mouthpiece and applies heavy pressure from the word “Go.” Kris will be doing anything in his power to keep this fight standing but thinks he holds the advantage wherever this fight goes, on the feet Kris will look to pick apart Blackshear, on his way to what would be his sixth professional victory, against what should be one of his toughest test of his blossoming career. Last fight: First round Knockout of Al Jones at CES 50. Summary: Blackshear opened the eyes of New England MMA fans just over one month ago when “The Diamond” made his regional debut at NEF 34 and stifled Featherweight prospect and top regional talent Aaron Lacey. Blackshear used heavy pressure and level changes to keep Lacey on his heels all night as he dominated the Maine native for three straight rounds for the Unanimous Decision victory in his New England debut. Blackshear will be looking for more of the same as he stands across from yet another top prospect in Kris Moutinho. Last fight: Unanimous Decision victory over Aaron Lacey at NEF 34. Breakdown: This is a tough matchup for the Star in the making; Moutinho who has shown some deficiencies with grappling in the past, suffering back to back losses via submission. Moutinho, however, has worked hard to patch any holes in his grappling game, falling back on his time as a Wrestler at Milford, High School. Blackshear isn’t a grappler exclusively but he does do a great job coming forward and initiating the clinch and changing levels to gain takedowns. Moutinho is going to need to make Blackshear pay for coming forward by landing strikes from the outside, Moutinho’s early striking will speak volumes on how this fight ends up. Kris can end this fight with one strike and does not plan on letting this fight go any longer than it needs to, as he will come out with high volume striking looking to finish this one quick. Summary: Sorians has posted back to back impressive victories in the CES cage since suffering his last loss to Levan Makashvili at CES 38, finishes of both Jacob Bohn and Jonathan Gary have put the Rhode Island native right back into the title picture as CES puts it’s vacant Featherweight belt on the line. Having been tested in some of the top promotions in the nation including Legacy FC and CES as well as a stint in the UFC Soriano has honed his skills into a complete martial artist with skills all over the cage. Featherweight Gold would be the crowning achievement for Soriano, who looks to claw his way back to the UFC roster. Last fight: First round Submission victory of Jonathan Gary at CES 49. Summary: One would be hard pressed to find another fighter in New England with a more impressive resume than that of Bruce Boyington. At 39 years young, Brewer, Maine’s Boyington believes he has just begun to write his story in the sport, as he looks to begin another chapter of his already storied career, by adding CES Featherweight Champion to a list of achievements that already includes accolades in the World Series of Fighting as well as a decorated career as the NEF Lightweight Champion. Bruce would love to let his stylistic striking do the talking as he makes his bid for CES Gold! Last fight: Third round Submission of Taylor Trahan at NEF 32. Breakdown: Athleticism will be on display as these two men meet with CES gold on the line. Soriano could be one of the more complete fighters in the region, possessing elite skills in all aspects of the fight game. Sorians is quick and calculated with his attack making every movement count when working his opponents. Once Soriano finds a weakness he is deliberate in exploiting it and finishing the fight. However 26 fight veteran; Bruce Boyington doesn’t know the first thing about weakness. Boyington is a stylish technical striker with one punch knockout power and ability. When Bruce is comfortable you can expect him to unleash a plethora of odd angled striking and spinning techniques. Boyington is also extremely strong for a Featherweight making him difficult to trap with his back against the cage, or the mat. Soriano is going to have to bring the fight to Boyington if he intends on getting his hand raised, if not, it could be Boyington leaving town with yet another storied New England Title belt in toe. Summary: To say that Nate Andrews is the best fighter in New England without a UFC contract would be a gross understatement, Nate has been wearing that moniker for sometime now as he waits for his phone to finally ring. Until then Nate will continue to do the only thing he knows; finish any Lightweight that stands in his way. With all thirteen of his career victories coming via stoppage Nate not only beats people, he does so in convincing fashion. With his eyes firmly set on a UFC roster spot, the CES Lightweight Champion continues to makes examples of anyone who wants a shot at his belt. With the sport’s largest promotion, the UFC, having vested interest in the outcome of Andrew’s fights, look for Nate to seek an early finish in this title defense as getting through this fight unscathed could further expedite Nate’s jump to the big show. Last fight: Second round Submission of Chris Padilla at CES 49. Summary: D’Juan Owens has racked up a 5-3 record since going the distance with Luis Felix at CES 27 having spent most of his time battling some of the toughest Lightweights in the Fight Lab and Next Level Fight Club promotions. Owen’s desire to finish fights quickly has put him in some compromising situations over his 29 fight professional career (also fought 12 times as an Amateur) but Owens comes out with his hand raised most often than not. Owens is extremely active from the opening bell, looking to advance position both on the feet and on the ground. Owens has the unenviable task of coming to the CES cage once again to face one of the promotion’s top dogs, and this time he has his sights set on leaving Rhode Island with the CES Lightweight Crown. Last fight: Second round Knockout loss to Mike Stevens at Fight Lab 58. Breakdown: There is no question what Andrews intends to do in this fight, Win Emphatically and Win Quickly. Andrews should have the upperhand in all aspects of this fight, when Andrews is in his groove on the feet he is a smooth as anyone, and once the fight hits the mat he is lethal in his relentless pursuit of submissions. From what I have seen from Owens I would imagine that he wants to keeps this fight standing, D’Juan does have some power in his hands and could steal this belt if he can rock Nate early, but Nate has shown a good chin, especially in his last against Chris Padilla. Although nearly anything can happen in an MMA fight, I see very few ways for Owens to get past the Champion Andrews in this one. If all goes as planned; Andrews leaves Twin River with his belt around his waist and his bid for the UFC can no longer be denied. Owens, who has virtually nothing to lose and seemingly everything to gain, isn’t in Rhode Island to be part of a plan. Owens would be happy to play the role of spoiler and be just the second man to solve New England’s best kept secret; Nate “The Snake” Andrews.